PRIVATE. ONE-OF-A-KIND PROPERTY. Stay with us in the middle of everything: 30 mins. 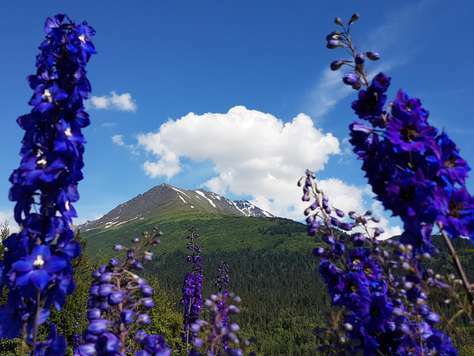 to SEWARD; 15 to COOPER LANDING; 1 hour to SOLDOTNA and the Kenai River; 2 hours to HOMER; 1 hour to Portage Glacier, Whittier, PRINCE WILLIAM SOUND and Alyeska. 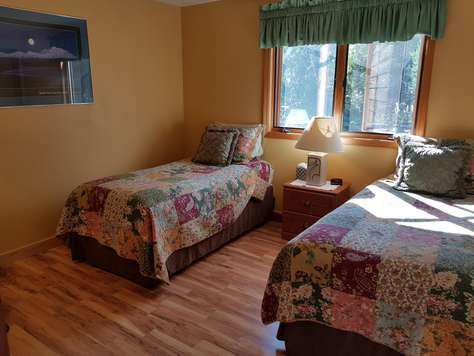 Just 30 minutes away from the popular KENAI FJORDS NATIONAL PARK, Exit Glacier and Harding Ice Field, and saltwater fishing on Resurrection Bay. THE KENAI and RUSSIAN RIVERS are 15 mins. away, where you can be fishing for world class salmon and trout, or rafting and bear viewing on the world-famous rivers. KAYAK OR CANOE Trail Lakes, or sea kayak Resurrection Bay. Miles of NEARBY TRAILS will fill a day taking you through lush forests to alpine meadows blanketed with wildflowers beside crystal clear snow-melt ponds and lakes surrounded by glaciated mountain majesty. FLIGHTSEEING can be done just a mile away. RIVER RAFTING is close by on the Kenai River - class 1-4 options available. THE PERFECT WINTER RETREAT. Relax watching the sunrise and alpenglow paint the mountains the full palate of Alaskan winter colors. Sooth your winter aches in the hot tub under a dazzling star-lit sky. 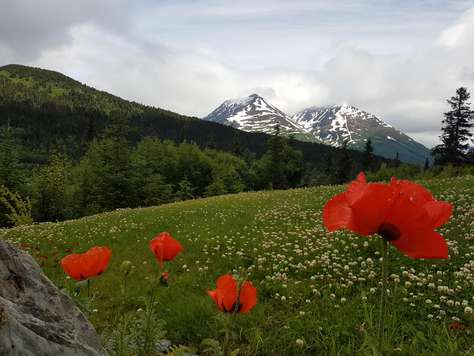 The world famous CHUGACH MOUNTIANS provide back-country Nordic and Alpine skiing and boarding, and snowmobiling just out the back door for your daytime adventures. Three chalets will accommodate parties of 1-22. EACH WITH A PRIVATE HOT TUB. Only 90 mins. 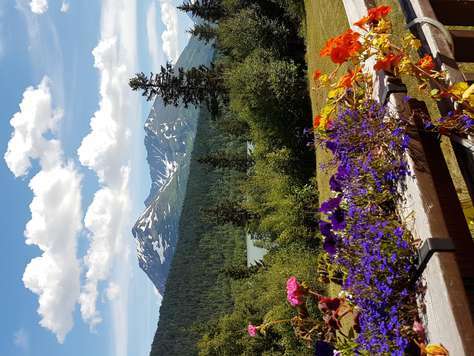 south of Anchorage, nestled among spruce and hemlock forest in the CHUCAGH NATIONAL FOREST, you'll be surrounded by snow-capped mountains, overlooking turquoise-colored Trail Lake. 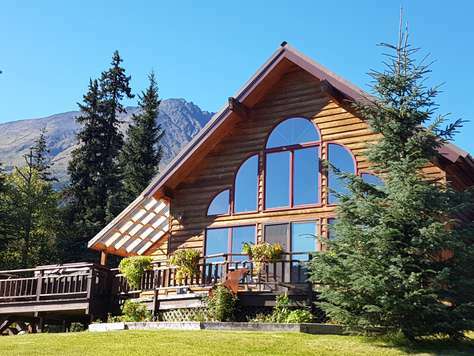 Our beautifully appointed, comforts-of-home-and-then-some chalets are your ideal home base for your adventures on the Kenai Peninsula. 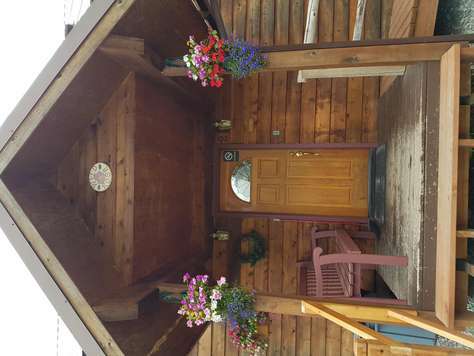 For COMPLETE info on the chalets and all there is to do in the area check us out on Facebook -Spruce Moose Chalets - and on our website Spruce Moose Alaska. This property has 2 Twin(s), 2 King(s), 2 Queen(s), 1 Futon(s). What a incredible fabulous 4 days we spent at Wild Rose in July. The house had everything we could possible need or want. The host and hostess were onsite which was an added plus. The host even made us a wonderful French Toast Brulee Breakfast. The house is centrally located between Seward and Kenai. The pictures of Wild Rose in the website do not do the amazing views justice. There was plenty of room for 7 adults, with room to spare. Don't hesitate when looking for a place to stay.....JUST BOOK IT! Nice location beautiful views. Only negative is the occasional noise from the highway and bi-planes taking off from the lake. But not enough to be an issue. Nice and quiet at night. We weren't there much during the daytime. We wouldn't hesitate to stay there again!! 1. Fantastic views. 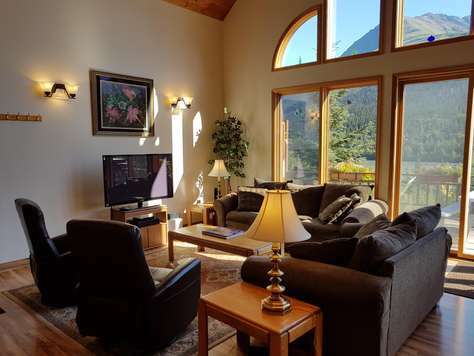 This property has lots of windows letting you see the mountains and the lake that is across the street. The view is stunning. 2. Hot tub. The hot tub is in excellent condition and sits on a deck outside those windows, so you have the beautiful view of the lake and mountains from the hot tub. 3. Kitchen. The owner appeared to have recently extended the size of the kitchen, and the kitchen is first rate. It is very well done. The owner also provides bottled water in the kitchen which we used for our coffee and iced tea. 4. Kayaks and canoes. The owner has kayaks and canoes that were made available to us. We had wonderful weather and took the canoes and kayaks out on the lake a couple of times. The lake is quite large, and we we spent a fair amount of time out there. With the views and the weather, this was an outstanding activity. 5. Wi-Fi and Satellite. Both the Wi-Fi and Satellite TV were nice additions. 6. Plenty of beds for our group of 8. But really everything was great. 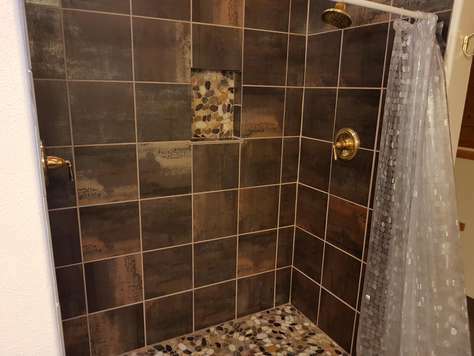 I have no negatives at all for this property. 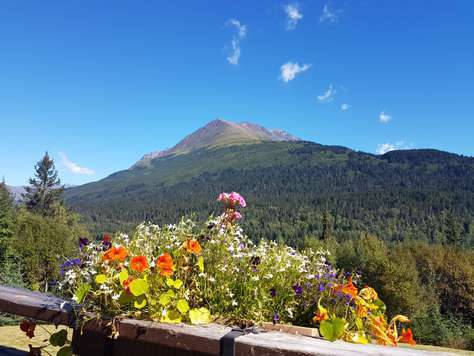 It is 30 minutes from Seward and any significant grocery stores or restaurants, but it is not a bad drive, and, of course, the scenery on the drive is wonderful. I just wish we would have spent more time here on our Alaska vacation. We really enjoyed our time at the cabin for the weekend. It was very accommodating and comfortable even tho we had 10 people. It never get crowded, had everything we needed and the owner was available to help us with any issues. 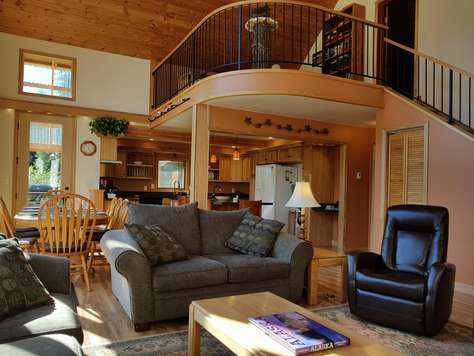 The location is ideal for a weekend getaway from Anchorage or the valley (or really anywhere). The drive is always scenic, but short to Moose pass. 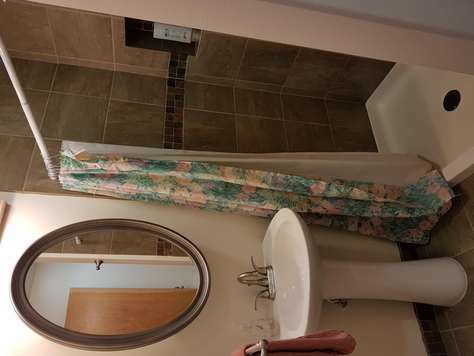 The home sits by a nice lake and conveniently close to Seward and many activities. 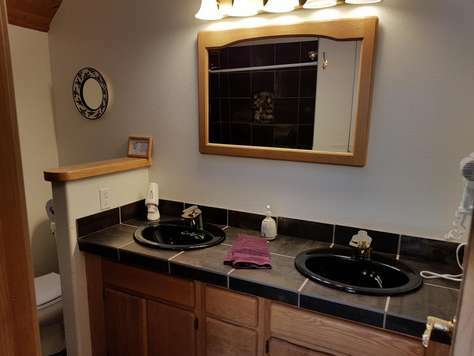 The amenities are great for small gatherings for dinner or a night in the hot tub! We thank Gary for his help in allowing our book club to stay there. We would definitely book again in the future! 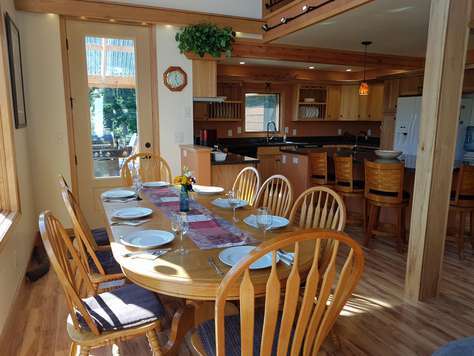 The Wild Rose chalet was gorgeous, clean, and quite spacious for our group of 7. Communicating with the owner was very easy and he always responded very quickly which was awesome! The owner also gave us great recommendations on things to do in the area such as hikes. For instance we went to his recommended Carter Lake Trail 4 miles away, which was gorgeous and offered beautiful views of the surrounding mountains! The provided information was very helpful so definitely read up on that and be sure to stop in Anchorage to buy all the groceries you need! We would definitely come back here to experience Alaska once again! Beautiful in every way -- the home design, decor, and scenery. Extremely clean and amazingly equipped with all the supplies we needed to feel pampered and "at home." Owners were always available to answer any questions we might have. Hot tub was a wonderful part of this home making for repeated times of relaxation. The layout of sleeping spaces was perfectly arranged for our family. 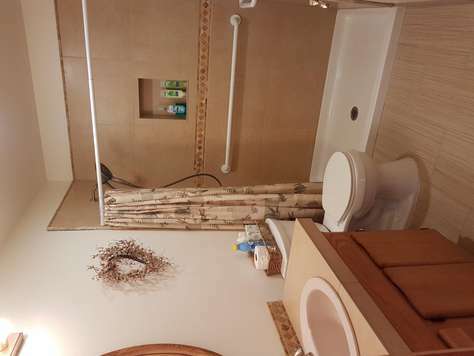 Three beautiful bathrooms, each connected to a bedroom. 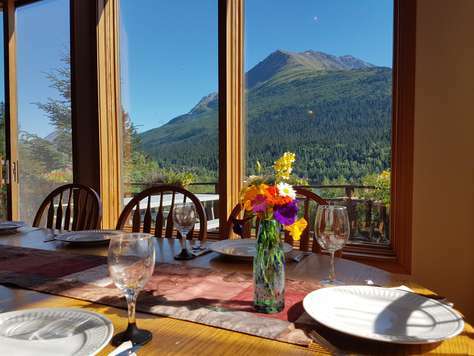 Easy access to outdoor recreation and a short drive to the town of Seward, where we enjoyed the Sea Life Center and restaurants. We felt so cozy in this home, we didn't want to leave! Our visit to the Wild Rose was wonderful. The Christmas decorations and the Christmas lighting gave us a warm welcome when we arrived. 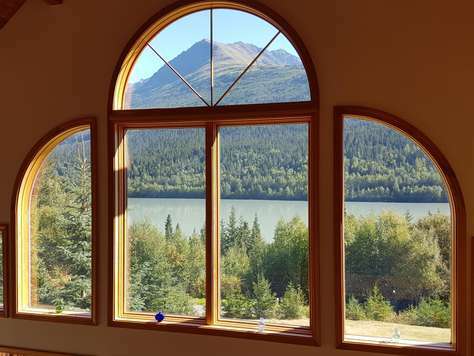 The window view is beautiful looking out over the lake and the mountains around. 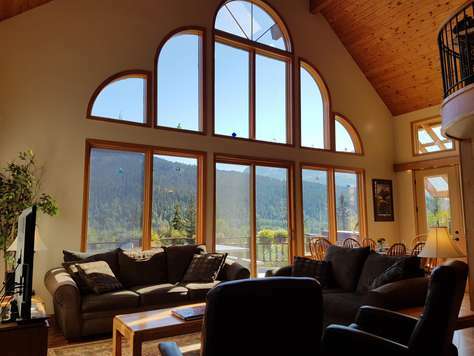 The vaulted ceiling with the loft gave a very spacious feeling, and I loved the arched design of high windows. The kitchen was huge and very nicely furnished. The island in the kitchen was a nice gathering spot around snack times and meal prep time. 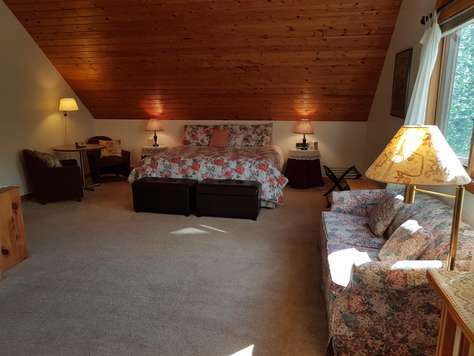 The bedrooms were great - the master bedroom upstairs was especially roomy. Our family of 6 thoroughly enjoyed our Christmas at the Wild Rose. 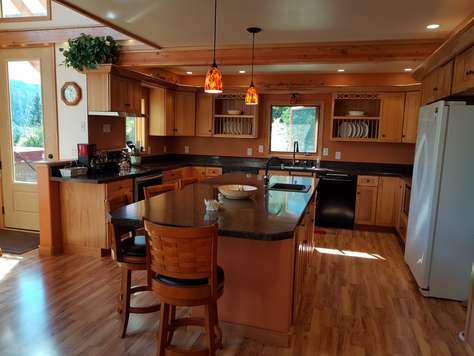 The home is beautifully laid out with a huge kitchen. 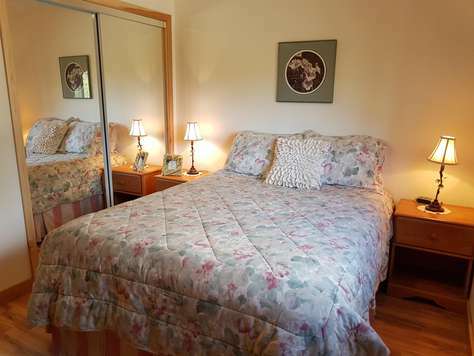 Each bedroom has its own bathroom and there is enough room for a couple of small families to comfortably "live" for the weekend. The views are gorgeous and Seward is close by. Definitely would rent this home again! The hot tub was wonderful.